For what its worth, this post cost me $30 in roses. But I think its worth it for the few husbands or boyfriends who could learn how to properly give flowers to their loved ones. The reason why I think this post is important is because many men think that buying roses and handing them to their wife/girlfriend will impress them. Well, it might be impressive until your wife/girlfriend has to go through the process of placing them properly in a vase without sustaining injury from the thorns. 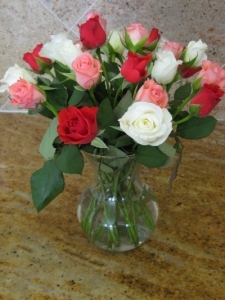 For the men who care to give their wife/girlfriend roses the right way this post is for you. Just keep in mind that this process really only works with at least two dozen roses. Since I can’t seem to be able to write a post without some background, here it is. When you purchase roses from a florist they usually tell you the basics about caring for them. 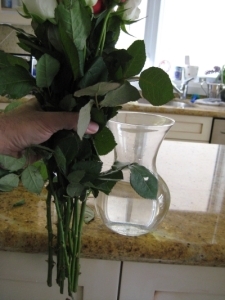 They’ll tell you to cut the stems when you get home, mix the powder (that they attach to the package of roses) with the water, and then place the roses in the vase. Well, there’s more to roses then just adding them to a vase. Several years ago when we first got married I bought roses from a rose farm. The roses were inexpensive and very pretty. The only problem was I couldn’t figure out how to get them to look as good in my vase at home as they did at this place. One day when I went to buy flowers there, I asked them to show me how to do it right. So here it is. First, you need the right vase. 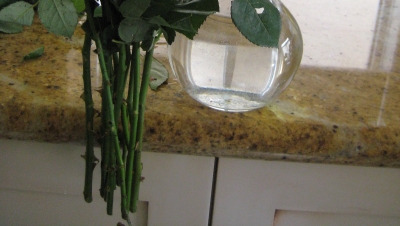 Believe it or not, there is such a thing called a Rose Vase. 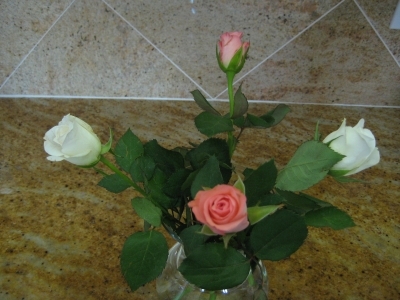 A rose vase is particularly important as its shape allows for the roses to be displayed properly. You will see later on in this post why this shape is important. 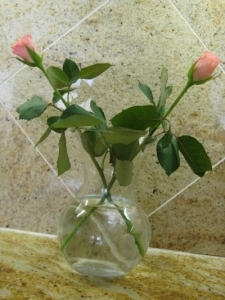 There are different styles of rose vases. Some are more rounded at the bottom while others are wider or rounder near the top. Just do a Google image search for ‘rose vase’ to see different shapes of vases. Before we cut the stems, we need to know how high we want them in the vase. 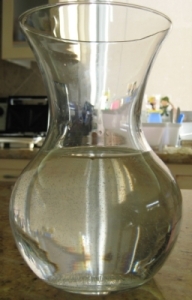 Place the vase near the edge of the table or counter. Grab the roses near the top, as there are fewer thorns there, and hold them next to the vase at the height we want with the stems going below the base of the vase and tabletop. 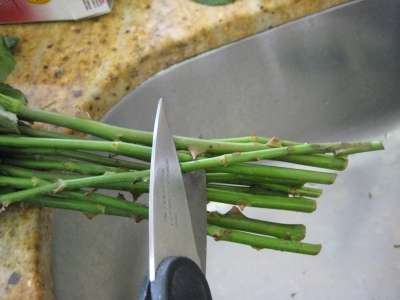 Now that we know where we want to cut, take a pair of poultry scissors or a sharp knife and cut the stems at an angle. 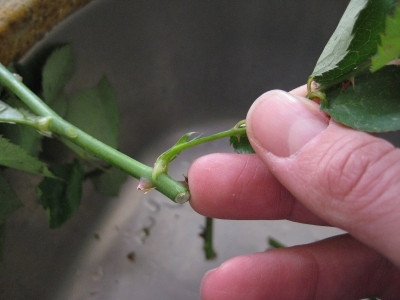 At this point, it would be necessary to remove all the thorns and leaves in the lower half of each stem. We remove the thorns so that we don’t prick ourselves but more importantly so that we can insert each stem properly and easily into the vase. 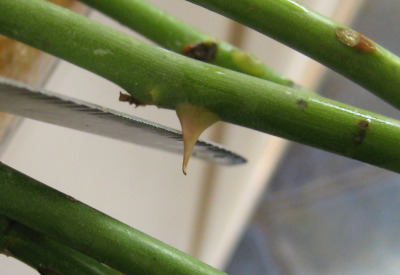 Remove the thorns by scraping the stem with a knife. Leaves that will lie below the surface of the water will need to be removed as well. 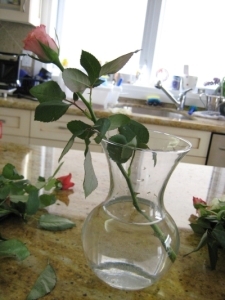 Fill the vase with lukewarm water and insert one rose so that it sits at an angle. Next, insert another rose on the side opposite the first rose. Now insert your third and fourth rose opposite each other as well as your fifth and sixth rose. Keep following this pattern until you have finished placing roses in this outer perimeter. 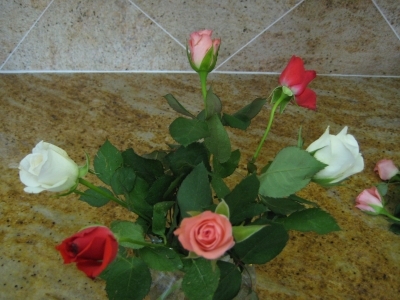 Make sure to leave enough space between each rose so that the roses buds are not touching. Once the perimeter is complete you can start inserting them in the middle of the arrangement making sure to distribute them evenly. 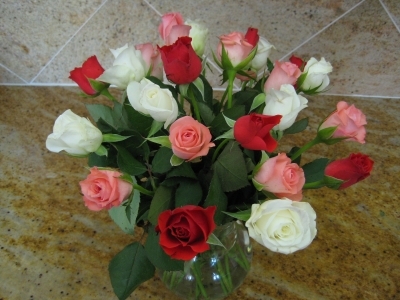 The final stage involves fine tuning your arrangement by adjusting the flowers so that each rose is evenly distributed. Once all the roses are in place, pick off any outer petals of the rose buds that look rotten or torn. If it does, then congratulations. If it doesn’t then your wife/girlfriend should still be pretty impressed with the time and effort you put in to make the arrangement. interesting. so there actually is a science to it. does this method keep the roses alive longer? Exploring in Yahoo I eventually sthmbled upon this webb site. site aand provides it a glance regularly. Next story Goodbye Lindsay Lohan. You’re Not Welcome Here.